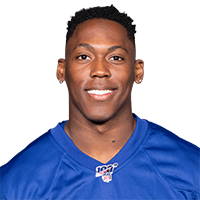 Published: Aug. 17, 2018 at 09:40 p.m.
New York Giants running back Wayne Gallman makes a huge cutback on the defense for an 11-yard touchdown run. Published: Aug. 17, 2018 at 07:57 p.m.
New York Giants running back Wayne Gallman sneaks past the defense for a 8-yard touchdown reception. Published: Dec. 31, 2017 at 04:08 p.m.
New York Giants running back Wayne Gallman shakes multiple defenders on this unreal 21-yard run.